#1…As much as I love officiating basketball I’ve been catching myself longingly looking at snowdrift covered baseball diamonds. Hot and humid, the smell of freshly mown grass and the buzz of bees circling a flower….baseball diamonds. My baseball rules books are on my nightstand, they’ll have to wait two more weeks. #3…After officiating over two hundred basketball games in the past 15 months my bride, Connie, will attend a game in which I officiate. She hates basketball but loves me so I appreciate her attendance. When she watched me work a baseball game this past summer the losing coach “F-bombed” me and there was “civil discord” in the stands, but she had left prior to that. Let’s hope Saturdays game is less dramatic. #4…I’ve had a couple of days off of work and no basketball games to work. Nothing’s good on TV so I went to the internet and found something that I’ve enjoyed watching in the past. Comedian Jerry Seinfeld has segments entitled “Comedians in cars getting coffee” where they drive around town discussing their views on events and their lives, then end up at a coffee house. Tina Fey, David Letterman, Sarah Silverman, Don Rickles, Jay Leno and my personal favorite, Brian Regan have been guests. I’ve found it fun and entertaining to watch and have included the link for your enjoyment. #5…Did I mention earlier that I was tired of winter? We’re supposed to receive 1-3 inches of snow again tonight. I think that our cat, Snicklefritz is ready for her normal perch on the sunroom….as soon as it warms up 80 degrees more. 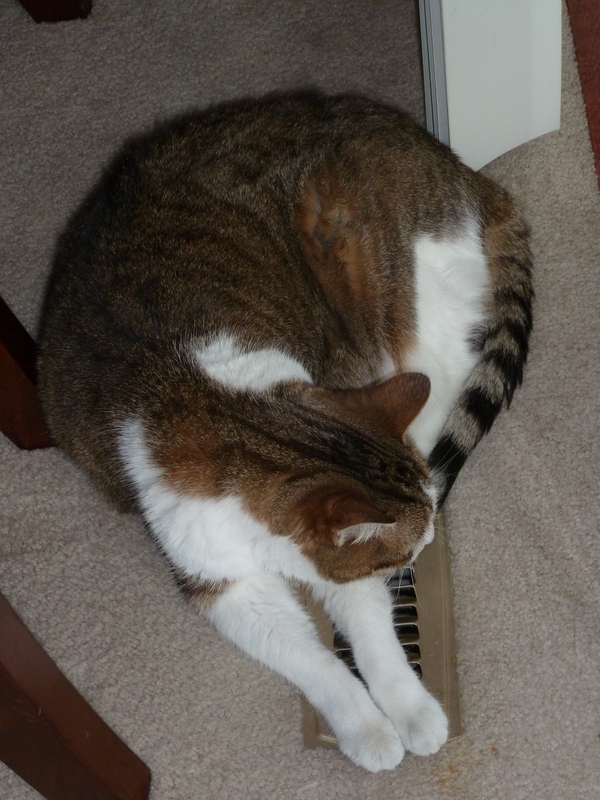 Our 13 year old cat, Snicklefritz, guarding the hot air duct as she dreamily wishes to be on the sunroom. Cards being sent early – brilliant! Oh Snicklefritz, you have it all figured out! Hubbs used to coach our boys in their various teams, and he was good at it, too. The kids loved him, he was fair and kind and a good teacher. But Hubbs is a tightly wound Virgo and I remember him throwing his hands in the air at a basketball call. Someone in the stands thought he flipped them off. Couldn’t be farther from the truth, but I remember coming to his defense in the stands, and the guy bleating out the insults was easily 2x my size. I can relate to Connie being in the stands and hope she’s surrounded by kind, good people and not morons like I often was. Stay warm, RR, another 6″ of wet stuff today and no end in sight! !